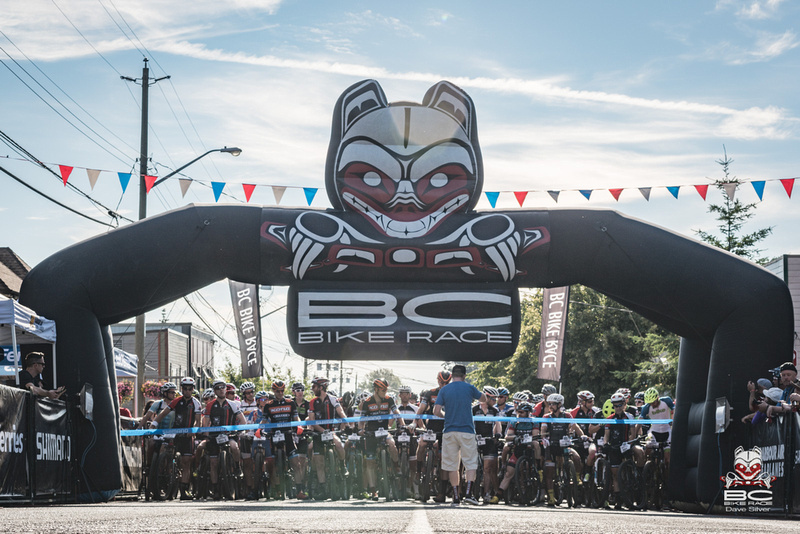 Searing heat and dusty conditions in Cumberland, BC break the seal on the first day of the BC Bike Race. Paxson and Nash defeat the heat and their fields. 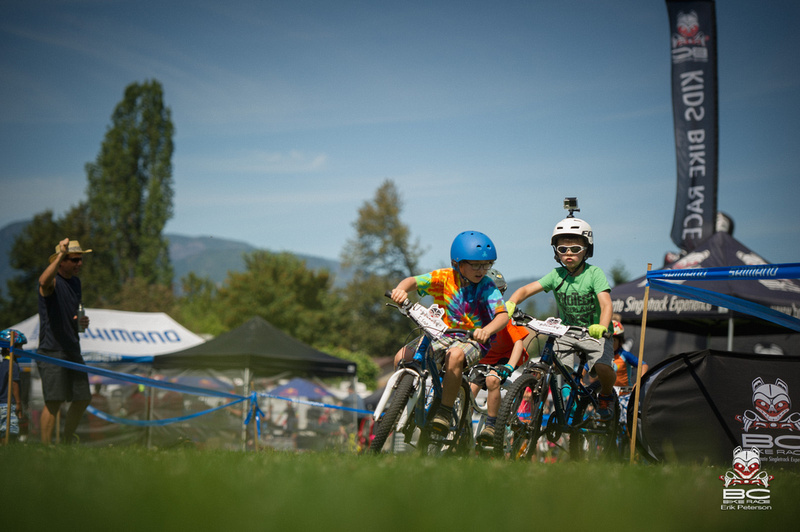 Saturday Registration in North Vancouver saw over 600 racers meet for the first time as they signed in, got their race bags, and dropped off bike boxes to meet them a week later in Whistler. Those pieces of luggage will soon be forgotten in the daily journey to the finish line after riding in an event known for the bubble it creates for it’s riders on their travels to the ultimate singletrack experience. After the Day Zero registration in North Vancouver, to get to Day One of the BCBR, riders took one scenic BC Ferries ride across the Strait of Georgia to Vancouver Island’s town of Nanaimo, then hopped a bus up the coast to the home of the opening stage in the small and rider friendly town of Cumberland. This turn of the century mining town with a past reputation governed by frontier laws has been a stage of the BCBR since it’s start nine years ago. 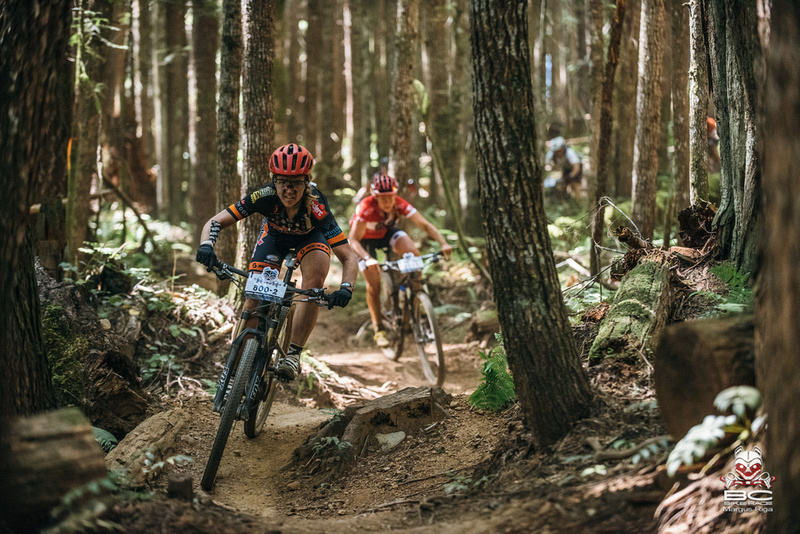 It’s the community that makes the trails of the Cumberland Community Forest a destination spot for riders from across the globe and it’s the BC Bike Race that brings the world to these trails and it’s storied past. After a hot introduction to their tents Saturday, racers awoke to a relatively cool Sunday morning, but temperatures quickly climbed in unison with riders on their opening miles of the stage. The gravel road leading to the first section of trail provided little respite from the sun and the relief of dipping into the woods this year was tempered by dusty conditions that made following the rider ahead too close less than ideal. With the usual loam now turned to dust, riders had plenty of traction but were treated to a taste of the organic material their tires were slowly churning to powder. Despite the dust caked faces and obvious signs of battle with the heat, the rider’s enthusiasm for the course continued as it has throughout the years. For the stage one winner of the Women’s Solo open, Katerina Nash (Luna) “The first hour was pretty challenging with the heat, but once we hit the trails things changed for me and I was just having a really good time riding the trails.” Nash raced in Colorado on Saturday and had a midnight arrival in Vancouver, but didn’t seem to suffer to greatly from the previous day’s efforts. Vicky Barclay (Stan’s NoTubes) made the first move of the day on the opening climb after seeing Nash’s opening tentative effort. Rebecca Hodgetts countered after the two reached the top of the classic trail Further Burger. With Nash waiting to turn up her efforts and a failing rear brake Barclay soon found herself back in third position till the end. Hodgetts pulled in eight minutes behind Nash and only three up on Barclay. 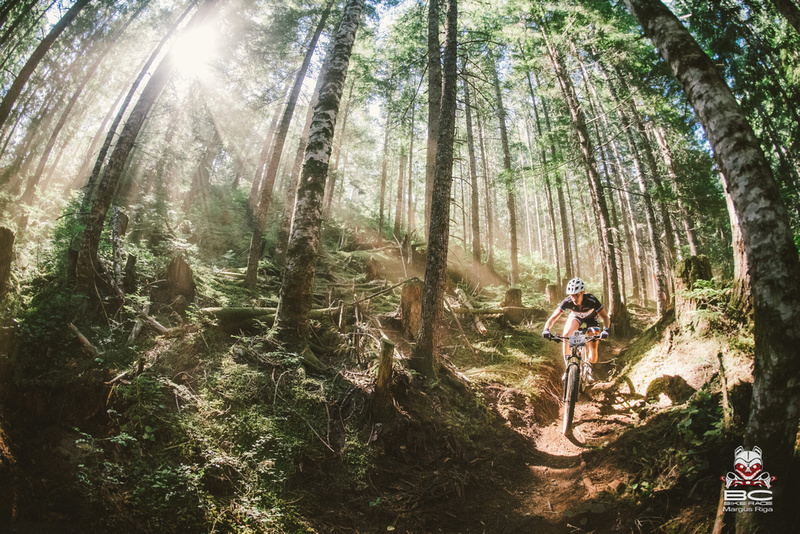 The BC Bike Race has traditionally been a male dominated event but the women who have chosen to race have routinely displayed an ability for shredding trails that demonstrate that flow and skill isn’t limited by gender. The men’s podium has an equal amount of potential for shuffling throughout the week. Last year’s second place finisher Spencer Paxson (Kona Bikes) started 2015 with legs good enough to take the first top spot of the week. 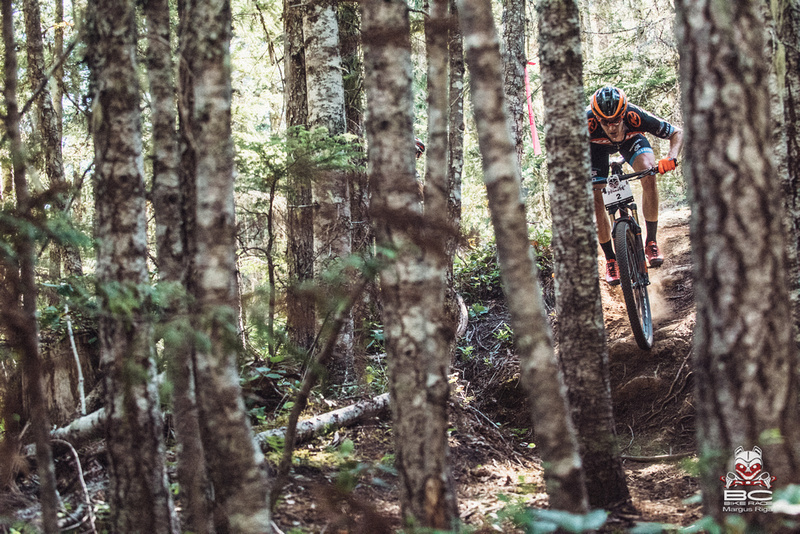 Paxson made an early move of the day and crested the top of the first climb on Further Burger with Quinn Moberg of Rocky Mountain Bicycles within the same second. Barry Wicks and Kris Sneddon (Kona Bikes) followed soon after with the Texan Tristan Uhl (Competitive Cyclist) and Thomas Turner (Team Jamis) from Georgia only a minute behind. After Moberg fell off of Paxson’s pace Wicks and Sneddon maintained their position while Uhl pulled up to them after dropping Turner before the bottom of the final gravel climb to the Feature Trail Blue Collar. Uhl continued to push for the wheel of Paxson while Wicks covered his moves to a sprint finish. Wicks took the sprint for second with Uhl in third and almost two minutes behind Paxson. Last year’s race champion, Sneddon, came across 17 seconds later for 4th. Moberg held onto a fifth another three minutes behind. 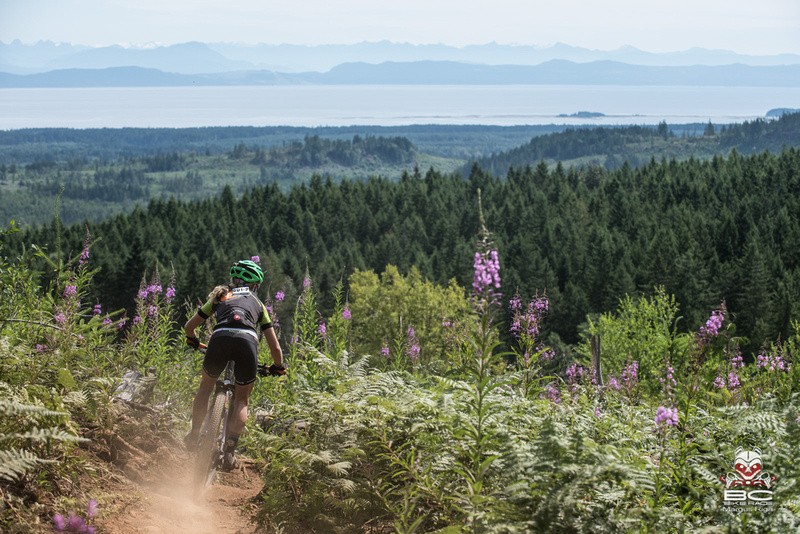 In an effort to showcase the trails that each community has a special relationship with, this year the BCBR is designating certain trails as “Feature Trails” to promote awareness of singletrack the community has put their hearts into. 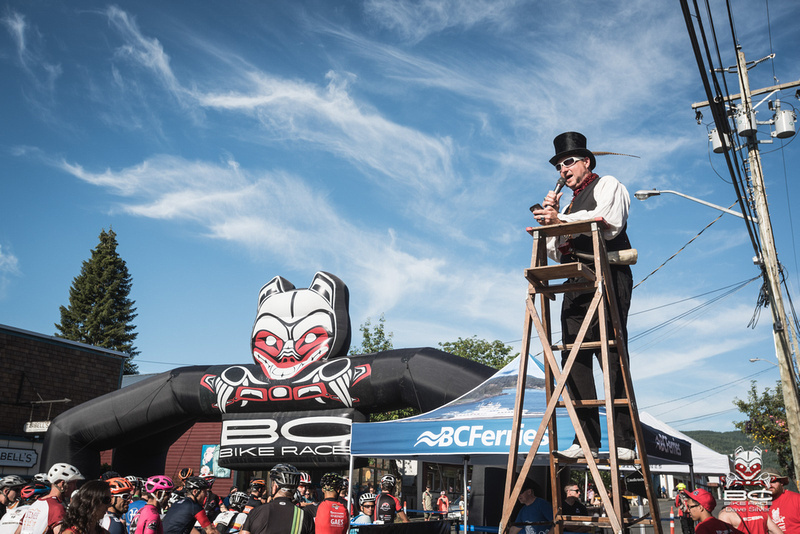 Every stop of the BC Bike Race is in a community that builds and maintains trails through thousands of hours of labor and often these trails become the source of great community pride. The BCBR diligently gives back to these groups every year to help them build or maintain more trails. “Blue Collar” was the feature trail of today’s Cumberland stage. As an older trail it was in need of a major rework. Originally built as an uphill trail is has become a favorite piece of downhill trail for the Cumberland community. Riding Fools Hostel owner Jeremy Grasby flagged the trail 8-10 years ago after discovering the zone on a hike. He used to haul his daughter in a trailer up the Trent Main road on adventures and realized the network of trails in existance needed a climbing trail to fill a gap. Because it was built from the bottom up the grade ended up being sustainable because of the grade and in turn became a favorite of the locals for descending. 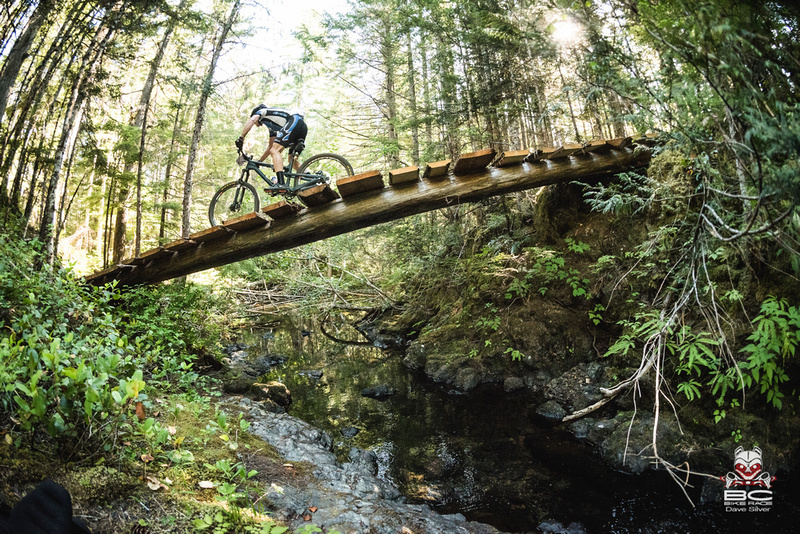 Grasby gives credit to the communal nature of building new trail, where an initial walk and flag is only an idea that is best hashed out with friends and other riders. The end result is an undulating trail that encourages full bike and body separation with good sightlines and no need for excessive braking when pointing the bike downhill. All trails have a history and early on Blue Collar dealt with losing a large part to logging and has been reworked recently to the point that the local Kids Club has been taken to the trail. This year Grasby was able to ride Blue Collar with the same daughter he towed up the gravel roads eight years ago. Five stages of the race this year will feature a kids race while riders are out on course. Cumberland saw over two dozen kids completing 1-6 laps depending on age. As an annual event the kids races have become a yearly destination for the families of the communities.